Numerous calculations determine the cost of college for a student. Luckily, you don’t need to crunch any numbers, but you should understand where the numbers are coming from. How else will you know if what you’re seeing is what’s best for your situation? One important number to understand is your EFC, or your Expected Family Contribution. According to the FAFSA official site, “The Expected Family Contribution (EFC) is a measure of your family’s financial strength, and is calculated according to a formula established by law” The EFC will be a number equivalent to a dollar amount. For example, 12000 is $12,000. Evaluating your family’s financial strength creates an estimate regarding the ability to cover a certain portion of college expenses. Meaning, the EFC number is not a concrete amount your family must pay for school. The number is a starting point. From this starting point, your school calculates your financial aid using the EFC Formula. All numbers calculated by the EFC formula are the result of information included in your FAFSA application. The formula is based upon current income and does not include consumer debt, such as credit card balances and auto loans. Therefore, credit card debt, mortgage debt, or the like will not increase chances of a more favorable EFC number. Any information provided on your FAFSA could impact the final number you will see. Your family’s income, student income, assets, and benefits coupled with family size and number of persons attending college are factors affecting your EFC number. If you are unsure about FAFSA questions related to these topics, check out our tips to approach tricky questions. Despite the vast range of information, income accounts for a large percentage when comparing factors affecting the EFC number. In fact, lower income alters what factors are included in the EFC Formula. A person or household making less than $49,999 and filing either IRS Form 1040 or 1040EZ may qualify for the simplified needs test. If you do qualify, the system will exclude assets in a simple form of your FAFSA, so the assets will not impact the calculation of your EFC number. Assets can have a less favorable impact on some EFC numbers, which is why this alteration is beneficial. The EFC number will be located on the top-right of the Student Aid Report (SAR) you receive, either electronically or physically, a few weeks after filing your FAFSA. This same SAR is sent to every school you listed as a recipient on your FAFSA. Each school considers your EFC to calculate how much federal student aid you are eligible for. More specifically, schools need the EFC number to calculate an equation measuring your “financial need” for the school year. 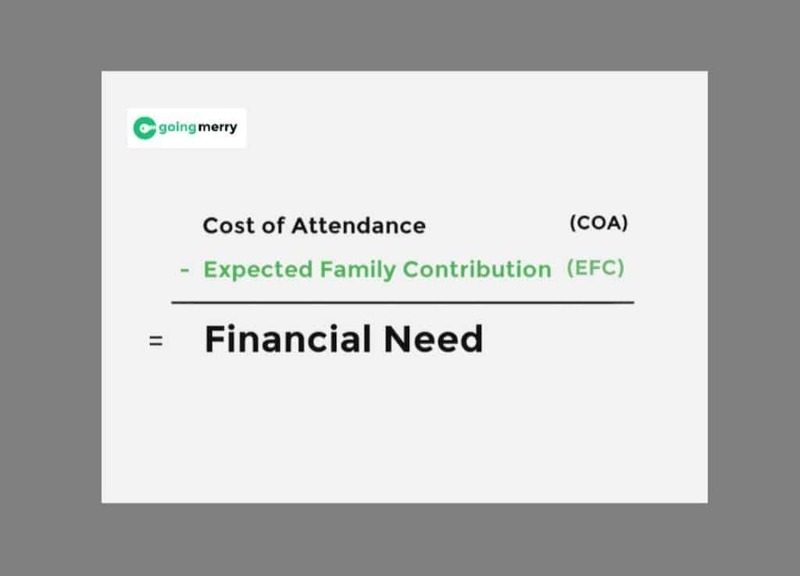 The schools perform the following equation: Cost of Attendance (COA) minus Expected Family Contribution (EFC) equals the amount of Financial Need. This financial need value, representing your need for financial assistance, influences the need-based financial aid you are eligible to receive. For example, imagine your EFC is $15,000. At a school where the COA is $30,000, your calculated financial need is $15,000. Now imagine your EFC is $22,000. At a school where the COA is $30,000, your calculated financial need is $8,000. As you can tell, a lower EFC is more beneficial. In comparison, if you have an EFC of $22,000 at a school where the COA is $18,000, your calculated financial need is $0. Your EFC is based on the recent year’s income. Therefore, your EFC could change from year to year. This is especially true in cases where the person in charge of income falls ill suddenly or becomes unemployed. The EFC must be calculated yearly to determine the current financial need of a student. You may inquire about receiving non-need-based financial aid for further financial assistance. 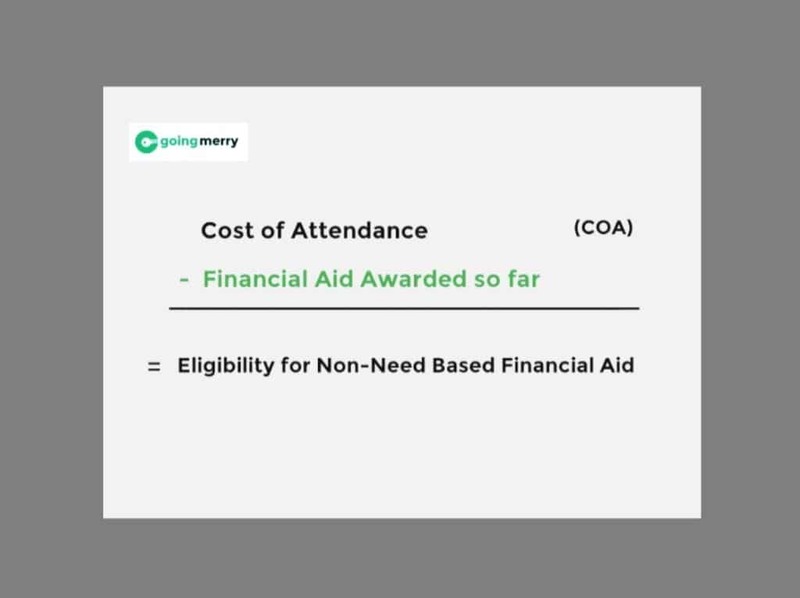 Schools use the following formula to calculate this aid: Cost of Attendance (COA) minus Financial Aid Awarded So Far equals Eligibility for Non-need-based Aid. In other words, your eligibility is based on the amount remaining after receiving need-based aid, scholarships, and grants. Direct Unsubsidized Loans and Federal PLUS Loans are non-need-based financial aid. Your EFC is not considered, and does not impact non-need-based financial aid calculations. Speaking of alternative cases, there is a possibility of a student’s EFC being zero. If your EFC is zero, the number on your SAR will appear as multiple zeros in a row. Tip: A person or household making less than $25,000 and filing a 1040 or 1040EZ tax return automatically has an EFC of zero. Having an EFC of zero does not mean the school will cover the complete amount of your financial need. Most schools can only cover 50-60% of the financial need for each student. After the amount your school is covering is subtracted, the remaining amount is called unmet need. The student or student’s family holds responsibility in managing unmet need and the EFC. Pretend for a moment, that your EFC is $19,000 and your financial need is calculated to be $8,000. Your school offers you $4,000 of need-based financial aid. This leaves $4,000 of unmet need. Consequently, the family needs to manage funds to cover $23,000 (EFC plus unmet need). Fortunately, a few colleges covering 100% of student financial need do exist. Ultimately, Expected Family Contribution symbolizes a proposition. The EFC suggests what a reasonable amount of financial responsibility would be for you or your family. Your eligibility for financial aid depends on calculating the suggested financial responsibility, cost of attendance, and current financial assistance received (during non-need-based financial aid). With this in mind, a good strategy to measure the significance of your EFC is estimating and comparing the unmet need between financial aid offers from different schools. The most important part is interpreting what your EFC means for your situation.